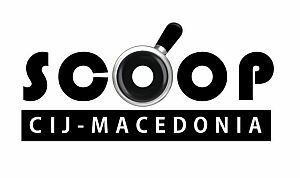 Founder of SCOOP Macedonia, an independent investigative reporting network whose work has been recognized repeatedly and has resulted in reforms championed at the highest level of government. Hadzi-Zafirova proposes to undertake an ambitious assessment of the state of Macedonia’s hospitals. 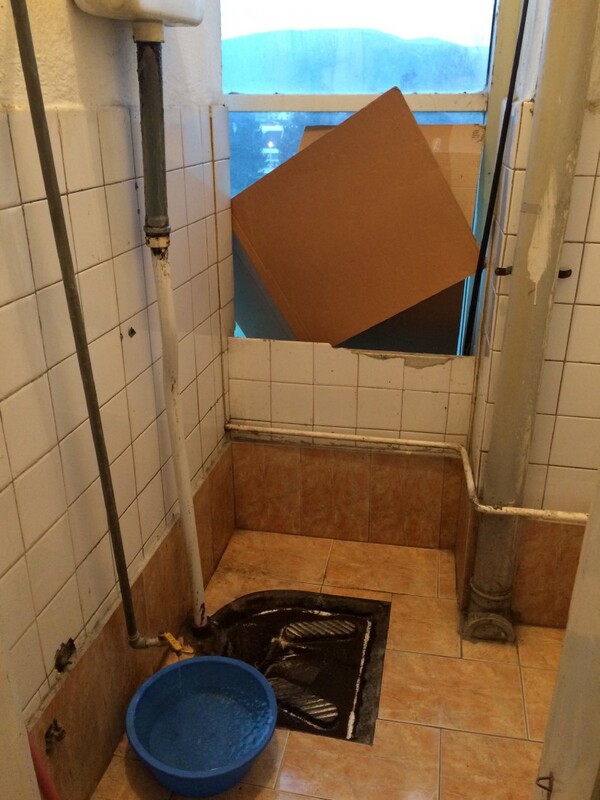 A recent visit to the main government-run clinic complex in Skopje provides a glimpse of the conditions we’ve been investigating. An old ruined building with a sign that reads, “Entrance for ambulance and emergences” sits on the edge of the campus. For years, patients here have endured wet, smelly halls and toilets, crumbling walls, and a general lack of proper hospital conditions. Some of the clinics in this complex, including the 50-plus-year-old internal medicine center, lack seating in the waiting rooms. Paint and tiles peel from the walls. In front of the clinic, a man struggles to push a woman in a wheelchair over the huge pothole not 20 steps away. The opthamological clinic offers patients two old chairs, one of which is broken. Even the campus’s newest building, the four-year-old gynecology clinic, has a first-floor bathroom with an overpowering stench, no soap, and no lock on the door – female patients’ partners typically stand guard outside. This month’s elections prompted the country’s ruling party to promise replacing the campus with modern facilities in four years as part of a larger project. Time will tell, but until then, patients will likely endure obviously unhygienic and uncomfortable conditions that have given rise to expert condemnation, and possibly even to medical complications, in the past. On the patient wards in a hospital in Gostivar, giant oxygen bottles substitute for a up-to-date, centralized oxygen-delivery system. April. For many it’s the best time of year, when people wake from a cold and long winter. For others, such as nurse Hava Sait Nexhip, it means the beginning of an annual, months-long water shortage at the medical campus outside Skopje where she has worked for eight years. “Each April till September we don’t have water,” Sait Nexhip says, though she can offer no explanation. “But this year we didn’t have water beginning in March. We get water from the village tap just for hygiene purposes. We only use it for washing dishes and hands. So we manage somehow,” says Sait Nexhip, who is concerned for her and patients’ health. Among those patients is the mayor of Aracinovo, the local municipality, to whom they have repeatedly appealed for help with the water shortage, only to be told it’s not a municipality issue. They have also appealed unsuccessfully to the town’s main clinic. These days the company next door has arranged to pipe some of its water to the facility after media coverage of the issue, as a short-term fix. Macedonia’s health system should be undergoing a renaissance, with a slew of new investments and reforms, including My Term, which allows patients to schedule appointments, and Pay Upon Performance, which pays doctors according to how many exams and procedures they perform. Instead in the past few years the health system has been blamed for unnecessary deaths, including that of Tamara Dimovska, a child born with a twist in the spine who also suffered from bronchitis. She died while waiting for the Health Ministry to clear bureaucratic procedures to send her abroad for an operation it had agreed to fund. Or the spike in the number of infant deaths in hospitals, which hit 261 in 2016. Or the recent deaths of two patients stranded on the roadside in a broken-down ambulance. All of which have left people in Macedonia wondering about the soundness of the country’s health care system. To help answer that question, we set off on a review of conditions in Macedonia’s hospital. Most of the general hospitals throughout the country were built in the 1970s, but some, including the one in Kocani, eastern Macedonia, opened almost a century ago. Officials at some of the hospitals we contacted said nothing has been updated inside since they were built. Others have received partial renovations, some of which were funded by foreign aid. And still others, such as the general hospital in the western town of Struga, have used their own funds for refurbishments. From 2006 to 2016, the Struga hospital spent more than 150,000 euros of its own money to upgrade its surgery, gynecology, internal medicine, and pediatric diseases departments as well as its laboratories and X-ray facilities, according to a statement from the hospital. Also in the west, the Kicevo general hospital has renewed its gynecology and obstetrics department thanks to a foreign donation. Its newest equipment came from the Health Ministry eight years ago. In the neighboring Gostivar municipality, officials say the hospital has received no recent upgrades, which seems clear from the crumbling façade and walls, broken electrical sockets, patched-up chairs in the waiting rooms, and worn-out floors. But most impressive is a visit to the toilets. One stall is screened off by cardboard, while the broken tap in a yellowed sink cannot be shut off. Cardboard provides a modicum of privacy for a squat toilet in the Gostivar hospital. A member of the medical staff complains to us on condition of anonymity. For example, the source points out, patients receive bottled oxygen because the hospital has no centralized oxygen delivery system, which should be standard. “We even carry oxygen bottles into the surgery theaters. As for the hygiene in this hospital, you can see for yourself. “The patients come healthier and leave sicker,” he says. The clinical hospital in Shtip, in the east, has renovated its gynecology and obstetrics department, thanks to funds from UNICEF. But the shower stall in the maternity wing’s bathroom lacks a curtain, the toilets are old – one lacks a seat – and used paper towels are strewn about. The air is stagnant and the door to one stall hits the toilet so it cannot be fully opened, which represents a particular challenge to the pregnant women who come to the department. Upstairs, a hole peeks from the shower stall, and water comes from yellowed pipes along aged walls. Still, some hospitals are being updated. The general hospital in Veles is freshly painted on the outside, but inside patients still find old chairs and sticky toilets. Patients in the internal medicine department sit on a simple, old chair, not fit for purpose, to get a bath. Some of its equipment is 17 years old and has not been updated in a decade. Urologist Dimitar Strovjanoski said his department received donated equipment in 2000 that is no longer usable. “In other countries that pay attention to proper hospital conditions, the equipment is replaced every three to five years. Here, the last update of this equipment was in 2009-2010,” Strovjanoski said. He said doctors in his department compiled a list of needs four years ago but none has been met. As a result, he said, patients with complicated urological conditions must travel out of town for treatment. That includes those who need biopsies – a procedure he was trained in more than two years ago but still lacks the necessary equipment to perform. Using the department’s old devices can be dangerous. For instance, a machine that uses electrodes in treating men with enlarged prostates has faulty wiring, putting patients and doctors at risk. “There are electric arcs that are dangerous to whoever is working with it, so if there’s even a tiny hole in our rubber gloves, catastrophic consequences can occur,” he said. In his hospital, he says, patients have rudimentary conditions. It would be nice, for instance, if rooms in the urology wing had their own bathrooms, given the nature of those patients’ ailments. “But the most important need for the patients is equipment that would contribute to quicker diagnostics and better outcomes,” he says. 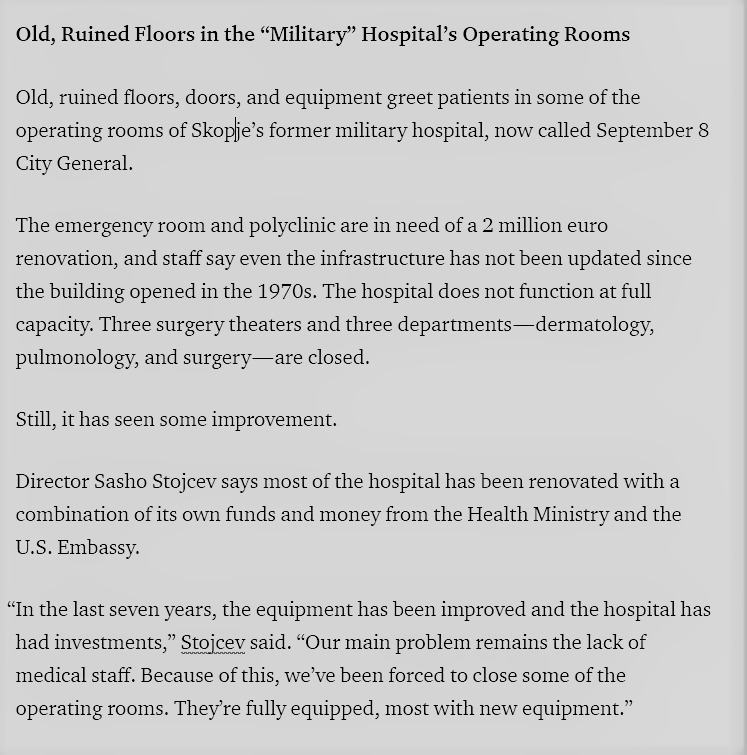 Strovjanoski’s patients could go to Skopje, 50 kilometers away, but conditions at the state-run clinic there seem less than salubrious. In the gynecology clinic, opened in 2011, the door on the ground-floor toilet, which needs a good cleaning, does not lock. Soap is nowhere to be found. In the pediatrics clinic, part of the ceiling hangs low. The government health and sanitary inspectorate did not respond to detailed questions about these conditions but said its 30 inspectors were not enough to keep a close eye on health care facilities as well as other institutions, including schools and kindergartens. “Nothing is better. It’s worse than ever,” said Menche Tochi, an award-winning journalist from НОВATV who has been covering the health system for decades. “There aren’t even pajamas for the patients who are hospitalized. Ten, 20, 30 years ago there were. Just for comparison, the patients a decade or two decades ago didn’t have to buy their own drugs. Now they’re forced to because often there’s little or no medicine in the hospital pharmacies,” she said, adding that the list of drugs covered by national insurance has not changed in at least a decade. Tochi acknowledged that the government has bought some new, expensive equipment, but she said outcomes have not improved. She dismissed reforms as “marketing,” to be forgotten when the political campaign ends. “For example, the My Term project might have been planned to bring order to the scheduling of patients’ exams, but it’s turned doctors into administrators, and now they can’t pay enough attention to their patients. … The Pay Upon Performance project isn’t even mentioned anymore. Irena Mulachka, of the Fokus weekly, won a prize for a 2016 investigation into the deaths of 80 infants in six months at the Skopje gynecology and obstetrics clinic. Staff there blamed the deaths on hospital-contracted infections. Throughout Macedonia, infant deaths in hospitals hit a five-year high in 2016. “Instead of conditions improving over the years, I can say that the public health system has hit bottom: ruined doors and beds, broken windows, bloody and dirty sheets that smell, cockroaches, unsterilized instruments, …” she said, continuing with a litany of issues that she said make it more dangerous to be treated in a hospital than at home. She said patients die waiting for the ambulance or because doctors lack basic supplies, including IVs and surgical thread. A few years ago, she said, a patient in Shtip nearly died from a burst ulcer for the lack of a probe that costs 15 denars. Most alarming, Mulachka said, is the rising mortality rates among infants. She said doctors at a Skopje clinic have told her that a baby dies there every third day, primarily due to infections contracted in the hospital. She said major issues have surfaced since the launch of the My Term program. “Some of the patients complain that weeks pass before they can schedule a basic exam and it takes four or five months to schedule specialized treatments. Doctors in this program have only 15 minutes to examine a patient while the rest of their time is spent on administration. Therefore, it’s not strange that we have increased mortality and patients dying like lab rats from a badly structured health system,” Mulachka said. Zaklina Hadzi-Zafirova became a journalist for a straightforward, but no less profound, reason. “I believe that through journalism people can publish the truth and they can influence, change, and improve society,” she says. The tireless Hadzi-Zafirova has more than 15 years of experience in Macedonian media. Under her leadership, SCOOP Macedonia has fostered hundreds of probes, which have been widely republished in domestic media. One of her recent investigations focused on the possible connection between pollution in Macedonia and an uptick in the cancer rate, even as the state has turned a blind eye to the country's biggest polluters. Another scrutinized the government’s unfulfilled promises to build several school gyms, and likely prompted Macedonian authorities to start building one of the facilities in a disadvantaged neighborhood of the capital, Skopje. Recently, Hadzi-Zafirova managed a series of short television documentaries. One exposed the scandalous living conditions for university students and prompted changes that were later announced by the prime minister. Hadzi-Zafirova says that independent reporting is scarce in Macedonia, a Balkan country of two million, where most media are labeled either “patriots” or “traitors” depending on whether they are sympathetic to the government. “In this atmosphere, it's hard to present the reality as it is,” she says. Macedonia has become a “country of fear,” Hadzi-Zafirova says, where people avoid expressing their concerns about the current political situation lest they lose their jobs or face other retaliation. In 2015 Skopje was rocked by a major political scandal after it was revealed that the phones of more than 20,000 people, including journalists, politicians, and business people, had been tapped. The opposition accuses the former prime minister and his close allies of carrying out the illegal operation. Media freedom in Macedonia has been deteriorating for years. According to Reporters Without Borders' 2016 World Press Freedom Index, the country ranks 118th of 180, a precipitous slide from 34th in 2009. Journalists in Macedonia face political and financial pressure, and some have even suffered violence that press advocates link to their work. Heavy fines or even prison terms are also used to intimidate journalists into silence, the report states. Hadzi-Zafirova cites the notorious case of reporter Tomislav Kezarovski, sentenced to four and a half years in prison for revealing the identity of a protected witness who later recanted his statement. Hadzi-Zafirova and organizations like SCOOP Macedonia are working for change by supporting and training independent reporters and investigating under-reported topics. “Citizens should be aware of their basic human rights and they should be actively involved in the decision-making process in society,” she says. To read about Hadzi-Zafirova's reporting proposal, please click here. Click here to see Zaklina Hadzi-Zafirova's reporting proposal.